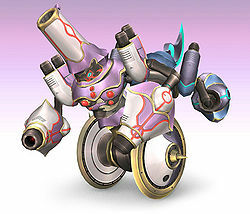 Duon (デュオン, Duon) is the sixth boss encountered in The Subspace Emissary. It doesn't hail from any particular series, and is unique to Super Smash Bros. Brawl. Its name is derived from the Latin word duo, a word meaning twosome, or a group of two, alluding to its two-faced design. Duon is a two-sided robot on one set of wheels; one half is pink and has a head cannon and two arm cannons, and the other half is blue with two arm swords and a curved blade on its head. Both sides have shoulder exhaust pipes which rockets (pink side) or mines (blue side) can be fired from (though these can also be fired from the arm cannons). It rotates 180 degrees to change its attack strategy. The wheels it pivots on are the Yin and Yang symbols from Chinese belief, symbolizing balance and juxtaposition of two forces. There is an invisible platform between Duon's two halves, making Duon one of only two bosses that a character can actually stand on, the other being Porky Minch. After Snake, Lucario, and Meta Knight kick all the Mr. Game & Watches out of the Halberd's control room, they fall to the bridge and dissolve into Shadow Bugs, which form into Duon, a last resort to defend the Halberd. It is confronted by Snake, Lucario, Fox, Zelda/Sheik, Peach, and Falco (Meta Knight stays behind to retake his ship and does not take part in the fight). The boss battle makes up the entirety of the Battleship Halberd Bridge level. After Duon is defeated, it dissolves into Shadow Bugs and leaves a trophy behind of Mr. Game & Watch. Duon later reappears in The Great Maze and is refought by the playable characters. Like all bosses Duon is controllable with hacks in Boss Battles Mode. The start button self-destructs any boss. Like all bosses in Brawl, Duon gains an additional ×0.6 damage resistance modifier when fought in co-op mode, effectively gaining 67% more health. This modifier is applied whenever the second player is in-game, and is no longer applied if the second player loses all their stocks. Duon's trophy is obtained by using a Trophy Stand on it during the boss fight. The Duon trophy in Brawl. A robot with two upper bodies sharing one set of wheels. The blue-bodied half uses sword attacks, while the pink one uses lasers from his head and arms for offensive power. Whichever side is facing you will attack. Duon also threatens with homing missiles and the blade on top of the blue half. Duon starts a combo of slashes. Duon finishes the combo with an upward slash. Duon dashes across the stage. Duon, having jumped upwards, lands with a crash. Duon fires a stream of energy shots. Duon fires a blue laser. Duon fires a barrage of missiles. Duon crashes into the stage, using the blade on its head to slice characters. The missiles that are fired out can be redirected to hit Duon, similar to Dr. Eggman's robot in The Doomsday Zone in Sonic the Hedgehog 3 & Knuckles. Even though the color is different, the shockwaves that Duon fires out are similar to Dark Meta Knight's shockwave attacks in Kirby & The Amazing Mirror. Duon is the only boss that can hurt itself without the aid of items or a reflector. Sonic's Homing Attack will always home in on Duon's pink side. The word "DUON" is hidden on its wheels. This can be more closely seen when examined as a trophy. This page was last edited on February 18, 2019, at 21:50.